When it came to adding a second baby to our family, there wasn't a lot of stuff we needed. A few fresh bibs and swaddles, another crib, and of course- more diapers. As far as 'gear' was concerned, we had all the big ticket items we needed. Except for a stroller. If we hung out in the last year or so, you've probably heard me bring this up and waffle forever. I always wanted a BOB jog stroller. A single. We never got one and turns out, good thing. Why have a one seater when you have two kids. So after spying a great deal on Mint Arrow, we grabbed a BOB Duallie. While I have no regrets buying (more like investing in) the BOB and it has come in handy numerous times, there are some major drawbacks. Mainly, I can't really take it anywhere indoors. We use it mostly for walks around the neighborhood and the occasional run, when I can convince Ashlynn to ride since she always wants to walk. We brought it to the shore when we went on vacation and it was amazing. We used it on the beach so we didn't have to carry Kenley on top of the chairs, toys, snacks, and towels and we would push the girls from our beach house all the way down the boardwalk to the rides, about a mile walk. But, the thing is heavy (and huge) and I struggle getting it into our Jeep Grand Cherokee. It also is not mall friendly or anywhere that has a standard size threshold door. We headed to the outlets once back in the Spring and the Husband and I had to take turns going into stores while the other waited outside since it couldn't fit through the crowds and narrow clothing racks and displays. This made me realize it was time to get another two seat stroller. I was met with a lot push back from a husband who once caught a Guiliana and Bill episode where Bill got on G for being a stroller hoarder with 13 strollers. You know, because owning two was apparently pushing the limit. 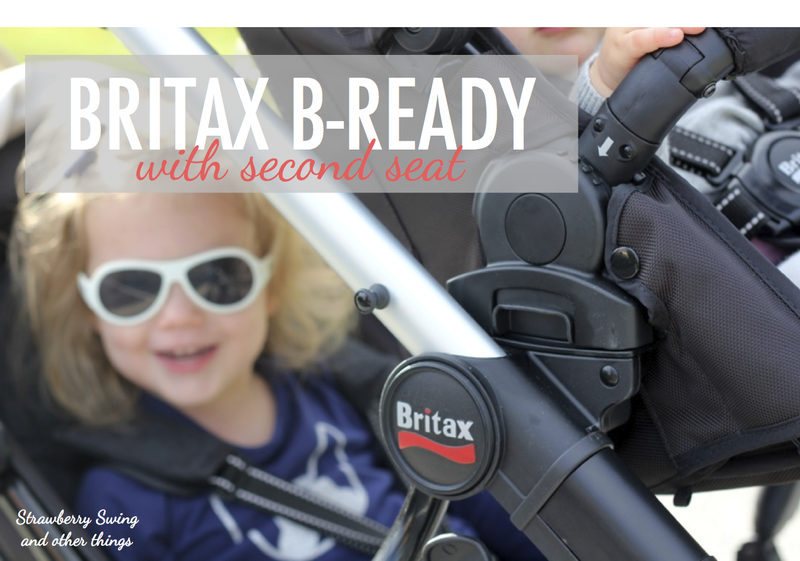 I was beyond thrilled when Britax let us try out the B-Ready with second seat. I had been researching everything from double umbrella strollers, tandem styles, ride on attachments, and narrower side by side styles, but since I have been so happy with our original Britax B-Agile stroller, I kept coming back to the B-Ready as our stroller of choice. The B-Ready has 14 different configurations, which I love. I could use it with Kenley's infant car seat, the Britax B-Safe, without needing to buy a separate adaptor. And now that she is uses her convertible car seat she can easily ride in either seat position. I can even swing the top seat to be rear facing if she wants to face me or recline for a nap. The bottom second seat fully reclines as well, so we can get two napping babes if we ever need. It'd also be a great stroller for a mom of twins since it can hold two infant car seats with a second adapter for the bottom. The adjustable handle bar height is perfect for taller moms and dads. It actually took me a ride or two to get used to since the Britax B-Agile is lower. I also have plenty of room for my stride when the second seat is attached, I'm not constantly kicking it. I did remove the storage canopy, but it can be attached while the second seat is in use if I need more room for items that don't fit in my diaper bag or I don't want to carry one. Both sun shades fully extend, Kenley's is only open half way in the picture above. They both have a magnetic ventilation window as well, which I love to use to peek in on them. When the stroller arrived, I was able to put it together by myself - with two curious kids roaming around, in about 10 minutes. I just had to pop on the foam filled rubber tires, mud flaps, and snap on the seats. I love that tires are filled so we don't have to worry about filling them with air like our jogging stroller and the mud flaps help keep the kid in the second seat clean and dry. A tiny detail I'm so glad that wasn't overlooked! The only issue I had was figuring out how to fully collapse the stroller when the second seat was attached. Once I figured it out, you have to push a button for the bottom seat to fully recline (photo above), it was a snap. The stroller also stands unassisted. It's definitely much heavier and cumbersome compared to my single seat B-Agile, which I can close and carry one-handed, but it's much easier to load than my BOB and fits fine in my SUV. One of the major reasons I wanted a tandem style stroller was so I could go shopping without the need of shopping carts or using a carrier to corral my kids. Shopping at stores like HomeGoods or Ulta (or the mall) have been pretty much off limits since I need to be able to keep Ashlynn from touching everything or becoming a flight risk, and I like having my hands free to shop. Having a tandem stroller allows me to navigate narrow aisles and of course get through doorways, unlike our giant BOB. I also love that this tandem stroller doesn't feel or push like a tandem stroller. Because it's a single seat style stroller first, it's not super long in length or feel like a boat to maneuver. And the best part, it's Kid Approved! Both kids seem really comfortable and happy riding in it. Which as any mom can attest, a stroller could pop out infinite jelly beans (dispense wine? ), but if the kids aren't happy... nobody's happy. And we, are very happy! Britax generously sent us the Britax B-Ready Stroller with Second Seat Attachment for our review. No compensation was received for this post and all opinions and experiences expressed are solely our own. As always, reviews, product sponsors, and giveaways are only shared with products or companies we already support and do business with, or feel are a good fit for the content and audience of this blog. To learn more about my sponsorship and review policies, read here. Interesting in learning more about Britax USA? 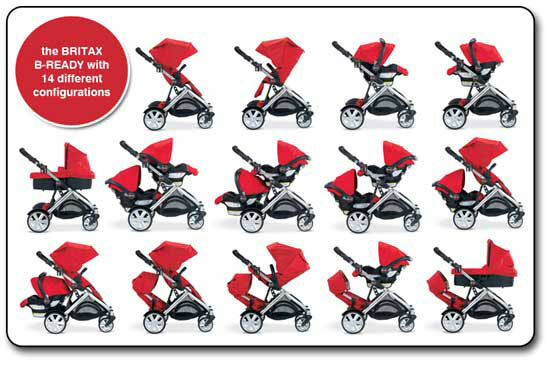 I've been eyeing that stroller- I love all the different configurations you can have. Glad to know it's not hard to push either. The ride is so smooth, it was one of the first things I noticed. And because the second seat attaches in the rear and not the front, it's not front heavy when steering or trying to pop up on a curb. It's like rear wheel drive for a stroller. I love that stroller! I'm pretty sure it wasn't available yet when I was stroller shopping because I totally would have picked it. Great review!! I know it's had a few versions, with the newest model having a change in the tires because there was some complaints (not sure what, didn't research, but read that new model had fixed a problem in reviews). I love that it's a great single stroller and also a double. I still use our B-Agile a lot since it's so easy to open/close and lightweight, but it's nice to having something else when I need them contained! Now you have me convinced that I need another stroller! Also, your shirt is so cute. Where did you get it? Oh! just in time.. were stroller shopping for Christmas haha. I'm so torn between this and another. Great review! and LOVE your jeans! Check out the video link I just posted above, it's a great comparison of the most popular brands. Definitely shows where each excels and falls short. And thanks, just cheap American Eagle, but you can't beat a cheap jean with a great fit! Great review. Will file away for maybe one day eventually when I may need it. Love your outfit!! Where is your shirt from?? of course! love your site and deals, thank you!